If you are a citizen of India and want to visit the United Kingdom, you will most probably need a UK visa to enter the United Kingdom. There are different types of UK Visas (enlisted below) and the purpose of your visit will determine the type of Visa you will require. Please keep in mind that the Government of United Kingdom has very stringent visa laws. So once you have planned to visit the UK for any purpose, its best to plan ahead and obtain the right type of Visa before making any travel bookings. You will have to submit many supportive documents along with your Visa application. It is very much possible that these documents were originally written in Tamil if you belong to any of the following states or Union Territories: Tamil Nadu, Kerala, Karnataka, Andhra Pradesh, Puducherry, Andaman & Nicobar Islands. According to the Government of United kingdom, all supportive documents should be originally written in either English or Welsh languages. If they are written in any other language, then they must be accompanied by a full translation (in English or Welsh languages) which can be independently verified by the Home Office. Further as specified by the Government of UK, all such translation documents should be proper certified translations. The full name and contact details of the translator or a representative of the translation company. Are you looking for certified translation in UK? We are a leading translation agency in London that provides fully certified translation services that are fit for all purposes. We also translate document online. To get your document translated online, please visit our translate service price calculator and make payment online. a letter from your education provider, on headed paper, confirming your enrolment and leave of absence. Get your education documents translated by the best translation company in UK. a Birth Certificate or legal document (such as adoption papers) showing the relationship between you and your parent or guardian. If the concerned document is in Tamil, then please ensure that you are attaching a proper certified legal translation as well. If any of these documents were originally written in the Tamil language, you will need a proper certified English or Welsh translation of such documents. We have years of experience providing certified translation services in UK for all kinds of Visa applications. Including English there are 23 major languages which are officially recognized by the Constitution of India. Though English is not included in the Eight Schedule of the Constitution of India, but holds the status of an official language. It is a widely accepted language and is extensively used by the Central Government of India. According to the 2001 Census of India, India is home to 122 major languages and 1599 other languages. These languages belong to at least 6 major families of languages which are the Indo-Aryan language family, Dravidian language family, Austroasiatic language family, Sino-Tibetan language family, Tai–Kadai language family and the Great Andamanese languages. Tamil belongs to the Dravidian family of languages and is the fifth most widely spoken language in India. According to the 2001 Census of India, there were about 60 million Tamil speakers in India which accounted for 5.91% of the total population. Tamil is primarily spoken in the Indian state of Tamil Nadu, and the Union Territories of Puducherry, Andaman & Nicobar Islands. It is also spoken in the neighboring States such as Kerala, Karnataka and Andhra Pradesh. 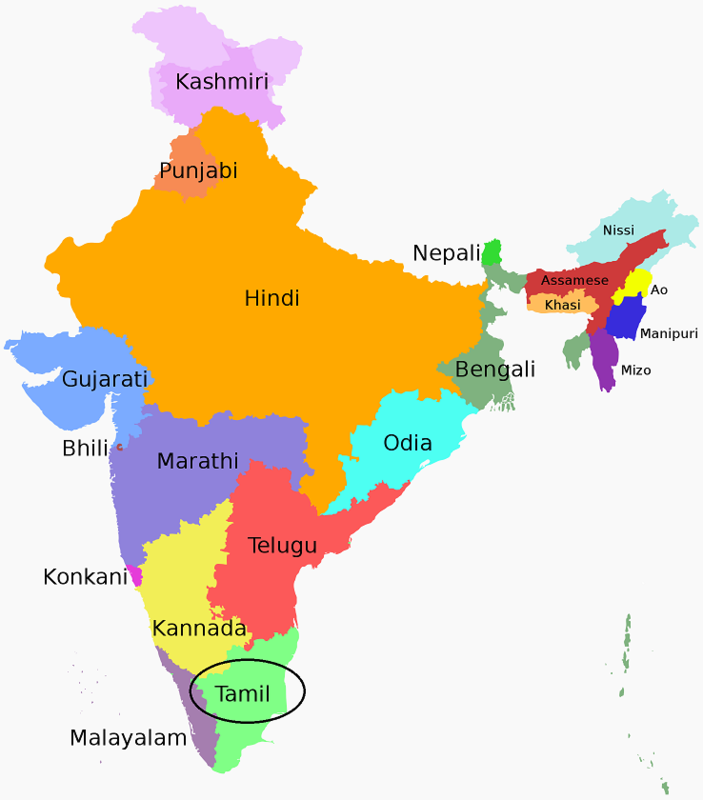 Besides India, other countries with a minority Tamil speaking population are Malaysia (co-official with Tamil, Mandarin, and Malay), Singapore (co-official with Tamil, Mandarin, and Malay), Sri Lanka (co-official with Sinhalese), Canada, Mauritius, South Africa, United Kingdom, United States, Australia, Bahrain, Burma, Denmark, Germany, Ireland, New Zealand and Sweden. If you have a valid passport or a national identity card issued by a member country of the European Single Market, you won't need a UK Visa to visit the United Kingdom. Such passport or national identity card must be valid for the whole of your stay. European Single Market is a single market that seeks to guarantee the free movement of people in its member countries. Member countries of the European Single Market include European Union (EU) member countries, which are Austria, Belgium, Bulgaria, Croatia, Republic of Cyprus, Czech Republic, Denmark, Estonia, Finland, France, Germany, Greece, Hungary, Ireland, Italy, Latvia, Lithuania, Luxembourg, Malta, Netherlands, Poland, Portugal, Romania, Slovakia, Slovenia, Spain, Sweden and the UK, European Economic Area (EEA) member countries, which includes the above mentioned EU countries and also Iceland, Liechtenstein and Norway, and one more country, the Switzerland. It should be noted that there has been no change to the rights and status of EU nationals in the UK, and UK nationals in the EU, as a result of the referendum.